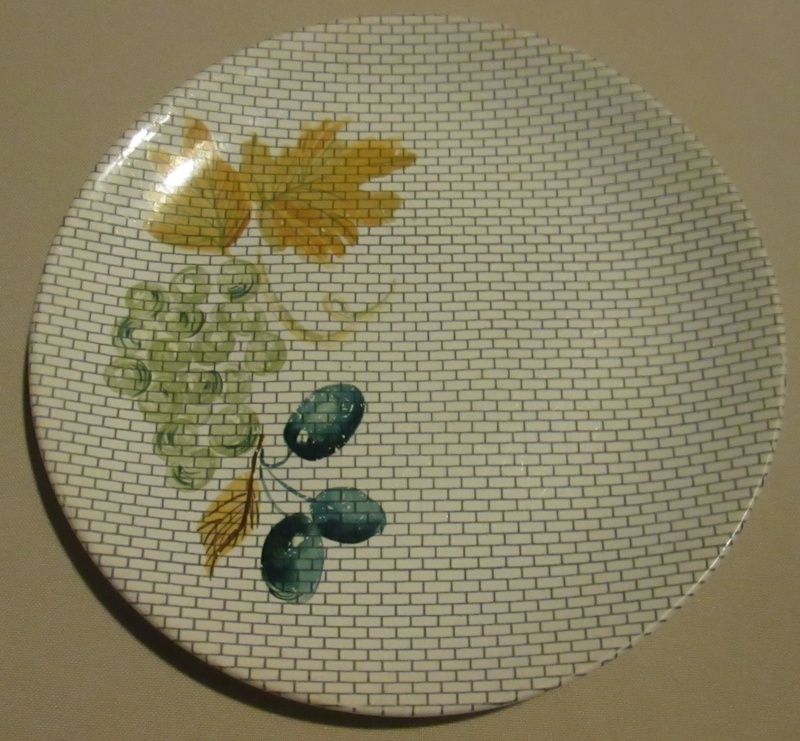 plate - Handpainted over the 'brick' background. Handpainted over the 'brick' background. I found this yesterday. Comparing it to Carousel, they are the same shape/size, weight. Has anyone seen this pattern before? I couldn't see it on the gallery. Re: Handpainted over the 'brick' background. 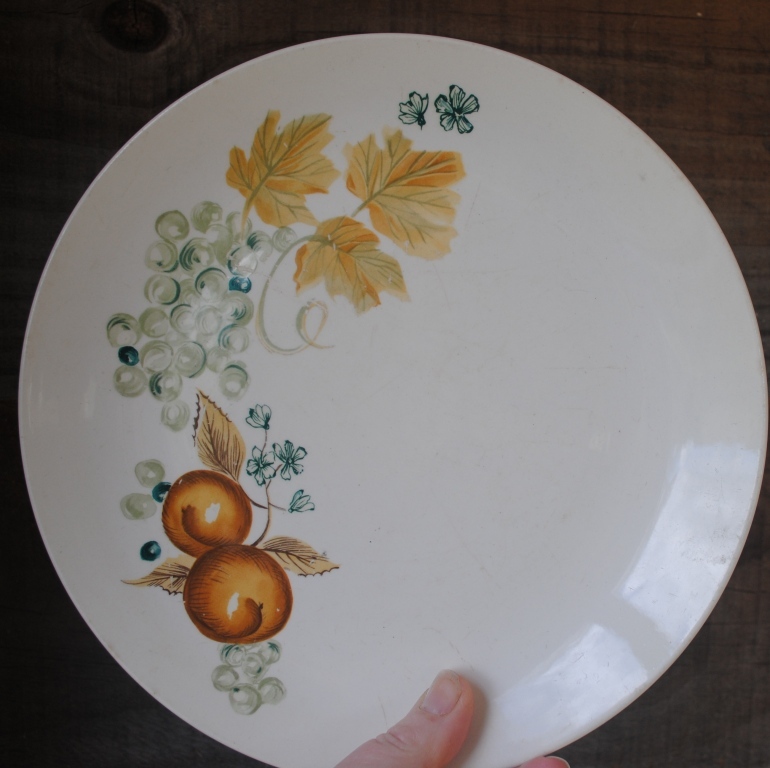 This most unusual handpainted side plate was only 50c as it had no backstamp. 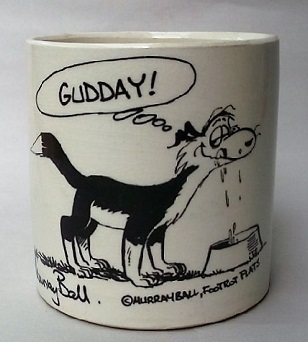 This may not have a pattern name, as it could have been a decorator playing around. wow.. this bears a simalar pattern to that random plate I found , mine had no backstamp either... Saturday girls having a practice? 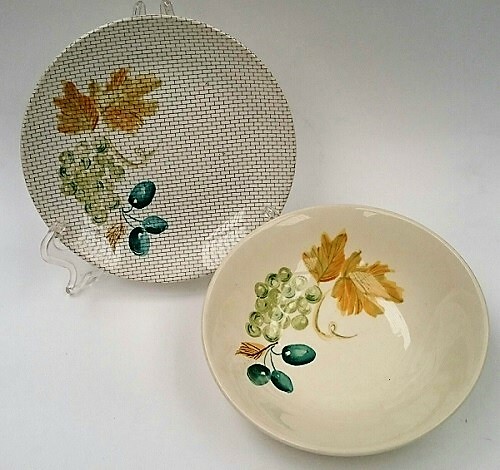 Gosh it does look like the same leaves and grapes even! Perhaps done by the same hand? 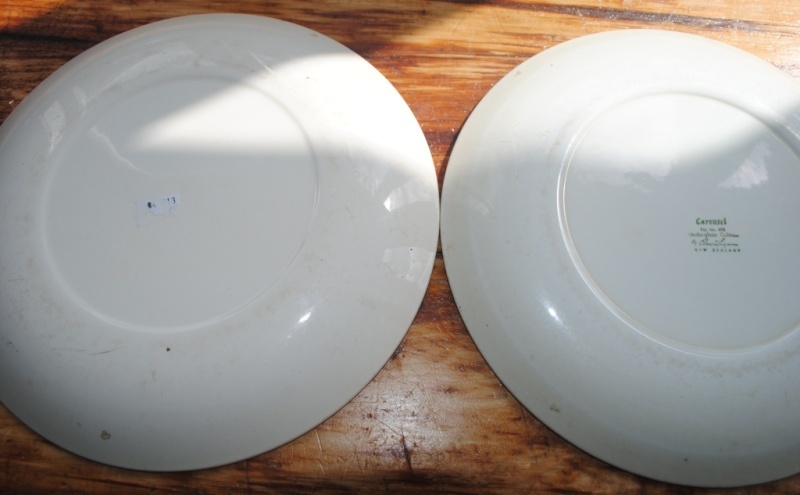 There was a TM listing, now expired but look on the second photo, this plate is there. When this person re-lists I will ask the question again as to whether there is a name on the back of it. The plate style looks like a "older style" Hard to tell though from the angle of the shot. I wonder if this Trader is part of the forum? Not sure if they are a member, but there is no member with that name. 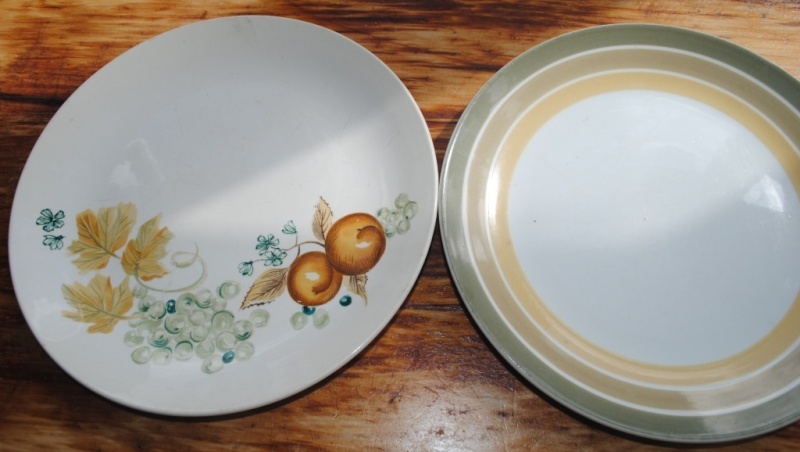 I'm thinking this is an on-glaze pattern that has faded as I found these 2 plates together today, both have no backstamp & are on brickette background. The side plate is in the best condition with just some surface scratches to the transfer. It has a pattern of Grape leaves, grapes & Olives. The larger 25cmd plate has Grape leaves grapes Pears? & random flowers. 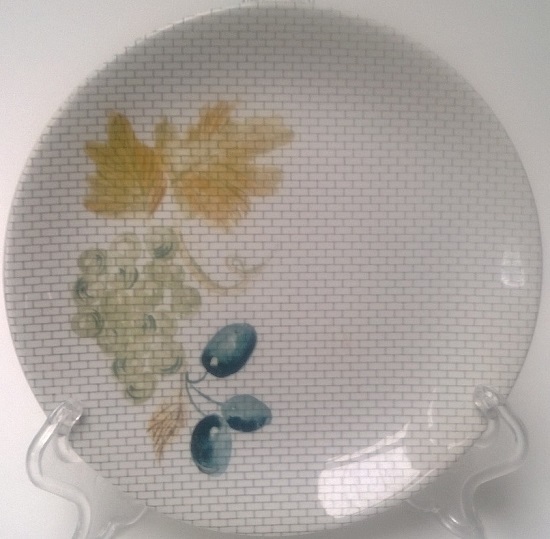 The larger plate is like the one I found but no grey background on mine... I have merged the 2 threads so they are all together. 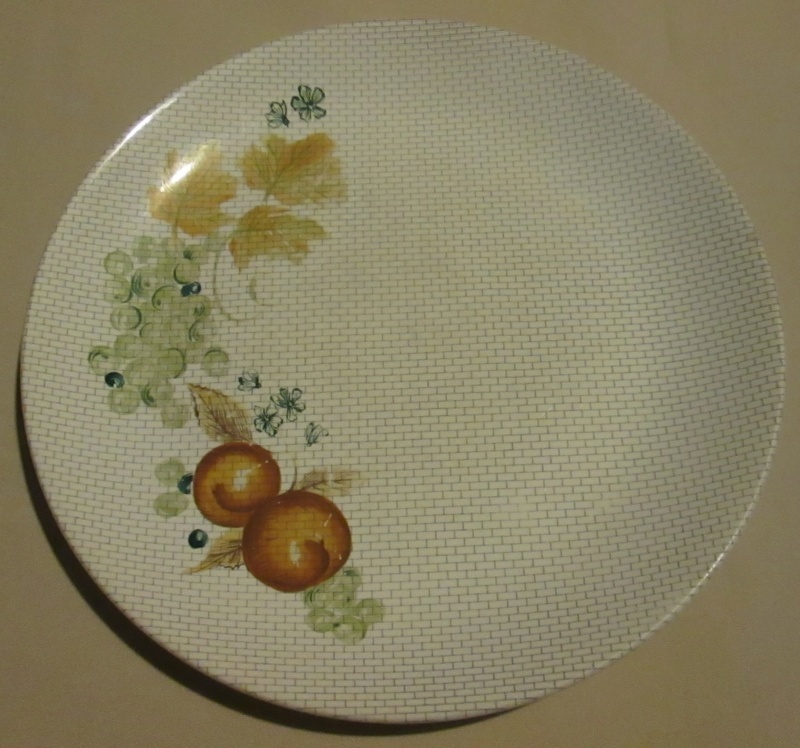 I noticed that Thelma found a plate with this pattern on the brick background and her comments can be found on the photo of this in the No Names Gallery. Today I found this pattern of grapes and grape leaves etc on a plain background. It is a decal and I could tell this by a scratch on one of the olives. No backstamp like the other ones above. There must be a pattern name out there somewhere for this. Photos of my finds .... and the quest continues as there are no stamps on these !!!!!! They are not handpainted as they match perfectly, so they are a transfer.